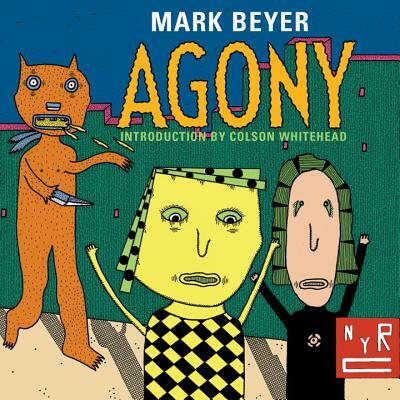 Reading Mark Beyer's Agony is a uniquely surreal and exhilarating experience. Beyer--a giant within the world of underground comics who once regularly graced the pages of Art Spiegelman's RAW magazine--draws with childlike abandon and tells stories (and jokes) like a man with a lifetime of suffering under his belt. I could try to say more about this book's bizarre charms, but the excellent introduction from Colson Whitehead does a much better job than I ever could. I'll just say: this is a book to tickle your funny bone and haunt your dreams. This NYRC edition features a recreation of the original, pocket-size, slipcovered paperback, designed by Art Spiegelman and Francoise Mouly. Mark Beyer is a self-taught artist who began making comics in 1975. His work has appeared in The New York Times, The Village Voice, and many other publications, and was a mainstay of RAW magazine. He created a series of animated shorts for MTV’s Liquid Television, designed album covers for John Zorn, and collaborated with Alan Moore. Amy and Jordan, the stars of his graphic novel Agony, were also featured in a newspaper strip that ran from 1988 to 1996, and which was collected in Amy and Jordan in 2004. His paintings and drawings have been exhibited around the world, including in Europe, Japan, and the United States. Colson Whitehead is the author of five novels, including Zone One, Sag Harbor, and The Intuitionist. His latest book is The Noble Hustle, a nonfiction account of the 2011 World Series of Poker. He is a recipient of a Guggenheim Fellowship and a MacArthur Fellowship.